I loved all the books of Jhumpa lahiri, especially the Namesake. I can very easily identify with the loneliness and longing for home of Ashima. Though am not as far like her but still I miss the warmth and friendliness of my neighbors, the loud adda (chat) from one window to the other and the familiar foods available in every lane in our town. Just like her I also sometimes try to recreate the taste and aroma of our very own street foods just to feel at home. But no matter how you try to recreate it, getting the same taste at home is never possible. You always miss on something. My father says it’s the dust on the roads and the low quality oil that gives it the unique taste. However, nothing could be compared with a plate of Mughlai Paratha or a trip to your local Fuchka (Panipuri) vendor for that sweet n sour taste and bursting in mouth sensation. Though every town has its unique collection of street foods but Calcutta’s street food variety knows no boundary. Ranging from their very own Chop, Singara, varieties of Roll, Mishti (sweets) to Chinese Chowmein, Chili chicken, Maharastrian Paobhaji, Southindian Idli, Dosa, Gujrati Dhokla, Mughlai Paratha, Tibetan momo with steaming hot soups, Western burgers and chips … it specializes in every genre of food available in the whole world. From full meals to simple snacks to quick refreshments, this city has an amazing diversity. A true Calcuttan can name all the specialized places of each and every street delicacy. Like best Phulkopi’r singara (cauliflower samosa) is available at Mrityunjoy in Lansdown, best kobiraji cutlet is only made at Regent in S N Banerjee road, Nizam serves one of the best double egg chicken roll, to eat best chicken rezala one has to head to Shabbir in C R avenue, Anadi cabin at S N banerjee road serves the best Mughlai paratha, Mishti Doi is best available at Ganguram and the list is endless. Bengal and Bengalis have a historical love affair with their street foods. chaat) among friends. Cause I can have chaat for breakfast, lunch and dinner. Though in my opinion Delhi serves the best chaat in the whole world but Calcutta comes as a close contender. My chandni chowkwali (a place in Delhi) friend once told me that the word chaat has actually evolved from the Hindi word chaatna (licking) cause these have such a tangy, pungent and spicy mix of spices that it will leave you to ask for more.The saga of Calcutta street food does not end here. This is only the beginning. 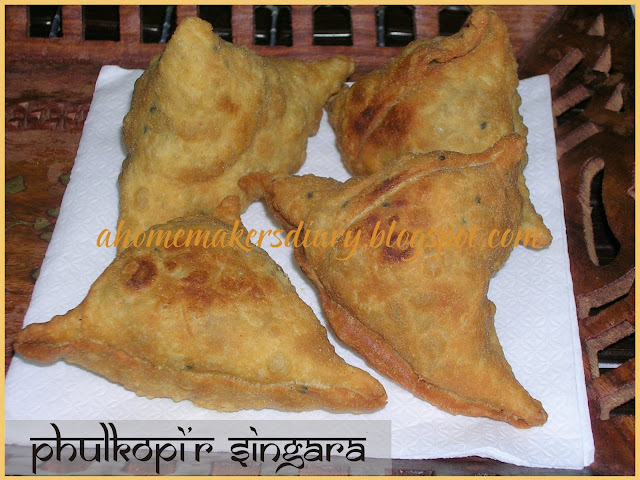 Phulkopi’r Singara (Samosa with cauliflower stuffing). 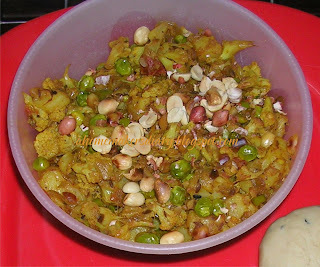 This is a winter delicacy as formally Gobi or cauliflower is a winter vegetable. Though these days’ cauliflowers are available through out the year but still this snack is specially made during the winter months. For the shell: mix the salt, flour, wheat flour and soda bi carb in a big bowl or plate. Make a well in the center and add the oil. Using little bit water at a time make a firm dough. Knead the dough until smooth. Cover in plastic wrap and set aside at room temperature for 30 minutes. In the meantime make the filling. Boil the potato and steam the cauliflower. Heat oil in a pan and put the cumin seeds and chopped green chilies. Add the onion and ginger paste and fry till the aroma comes. Add in all the dry spices and fry for another couple of minutes. Finally mix the cauliflower and the cubed potatoes. Cover and let it absorb the entire spice aroma, put 2-tablespoon water, mix well and again cover. After 5 minutes add the peanuts and fry for some more time. Mix in the lemon juice and switch the heat off. The filling would be dry. Let it cool completely before stuffing. Divide the dough in three equal pieces. Make each piece into a ball and roll out thinly. Divide this circle into two equal pieces with a knife. Brush the straight edge with water and fold so that a cone shape is made. 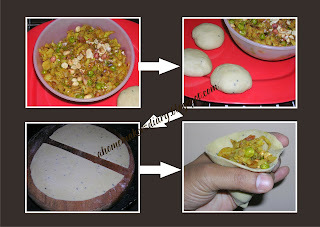 Hold the cone in your hand and fill in the cauliflower mixture. Now using some more water again dampen the edges and press to seal the top of the cone. Frying: Heat oil in a heavy bottomed pan. Deep-fry the singara on a low flame until crisp and brown. Take out and drain the excess oil on tissue paper. Serve hot with sauce. 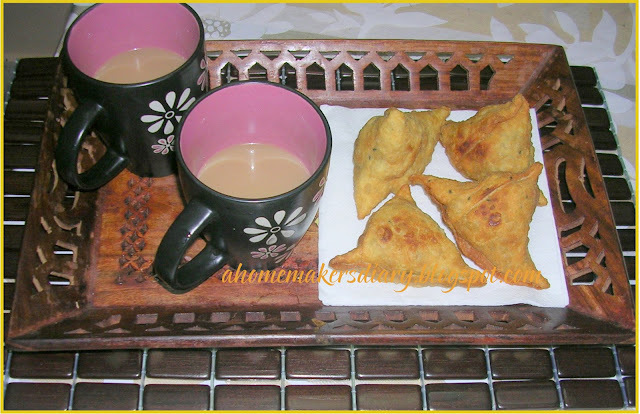 We enjoyed our Singara with some hot masala tea. Thanks a lot Sharmila for visiting my blog and for your encouraging words. Please keep leaving your precious comments. This was delicious! Everybody liked it. It was a good introduction to Bengali food for my friends, who had only eaten Punjabi food, because that's mostly what we get over here in L.A.
My husband has been asking for Bengali style 'phulkopir singara' for last few days. To fulfill his wish I have started to looking for the Samosa recipe in internet and I have reached her. I am amazed by seeing your talent over here!! Your blog is fantastic, very nicely done, very impressive, helpful and encouraging too!! Please keep up your good work. Thanks so much!! @Rima, thanks a ton Rima. your comment made my day. Thanks a lot. I was desperately looking for singara, which I used to get in Kharagpur Railway Station. Thanks a lot. After a long time we had yummy singara at home. We had missed for years. Thank you Ambreen for your comment. glad that you enjoyed it. luks hot n spicy.perfect shape n luks yumm 2.. These were great, thank you!